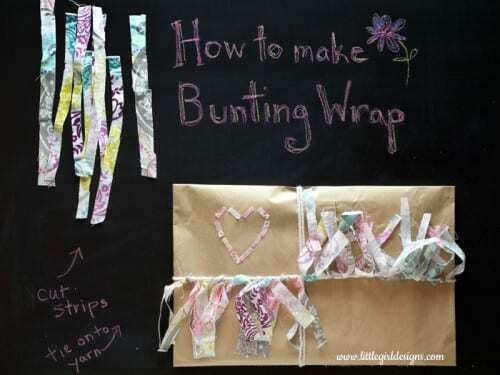 Make beautiful fabric bunting gift wrap when gift giving. 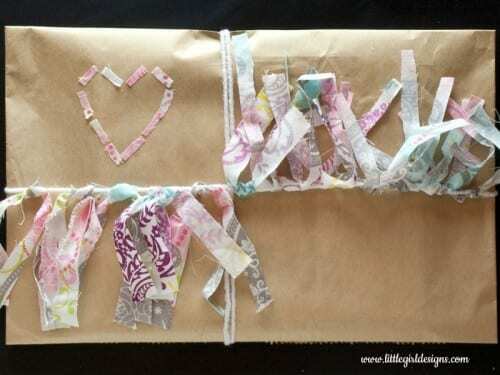 An easy DIY craft tutorial idea that shows how to be creative with your gift wrapping. Hi there, I’m Jennie, and I blog over at Little Girl Designs. I write about crafting, creativity, and giving with joy–I just love coming up with fun and creative gift ideas for my friends and family. One of my goals is to use up the stash of craft supplies I already have lying around rather than buying new supplies every time I make a project. And in this particular case, I helped lower my sister’s increasing fabric scrap stash. Since one of my sisters has been on a sewing kick as of late, I decided to ask her if she had any scraps that she’d like to get rid of. She brought me a few squares, thinking it was a paltry offering but it honestly was way more than I needed. It doesn’t take much to make bunting wrap! This is a great way to use up old fabric scraps. This is also a kid-friendly project–you can cut the fabric strips, and your kids can tie them onto the yarn. Cut fabric into narrow strips, approximately 8 inches long (You can make them longer or shorter to your personal taste.) Set aside. Wrap your gift and tie with yarn or ribbon. The yarn will be the anchor for your bunting. Tie each of the fabric scraps onto the yarn until you have a cute row of bunting. I also glued a few tiny scraps onto the gift package to form a heart. If you’d rather use this bunting to decorate a space in a room, just tie the fabric scraps to yarn or ribbon and tack the bunting up. I just made some for my daughter’s room, and it really brightens everything up! If you like this project and would like to see more craft ideas, click here to go to my crafts page. I update it frequently with new DIY craft inspiration. You can find me on Pinterest, Facebook, and Instagram. I also have an Etsy shop where I sell ABC Printables for baby’s nursery. Thanks, Katie, for letting me share with your readers today. Have fun crafting! Do you have a fun way you like to personalize and wrap gifts? Share and leave a comment below! 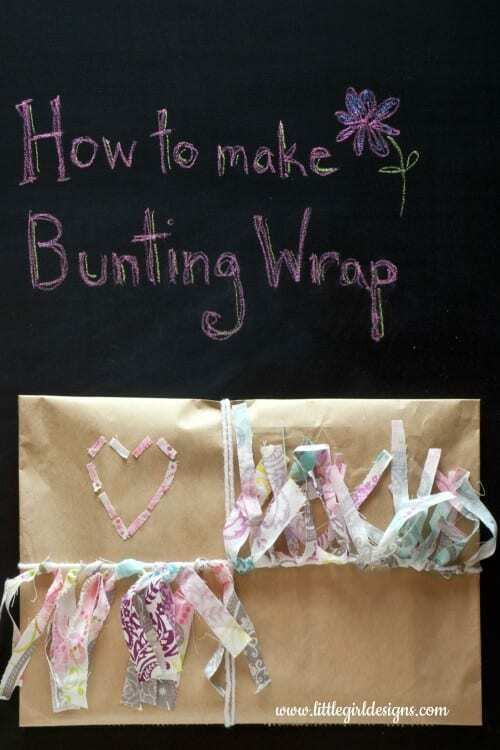 SAVE HOW TO MAKE BUNTING GIFT WRAP TO YOUR FAVORITE HANDMADE GIFTS PINTEREST BOARD! So pretty! And great reuse of little scraps. What a cute idea! I just wrapped a present in brown paper a couple hours ago, I wish I had seen this post first. I used fall leaves to embellish it some. But if I had seen this I would of tried it. Very pretty! so cute! I made fabric scrap bunting for a birthday party but never thought to use it to wrap a gift. Thanks for sharing this at Welcome Home Wednesdays! What a clever idea! Thanks for sharing at the Celebrate Your Story Link Up Party! So fun! I love bunting, too, particularly when hung from a giant balloon! Thanks so much for sharing over at Celebrate Your Story! I hope we see you again this week. The party opens at 8:00 PM on Saturday night!